365 days of wonderful: Tiny Town....so Tweet! 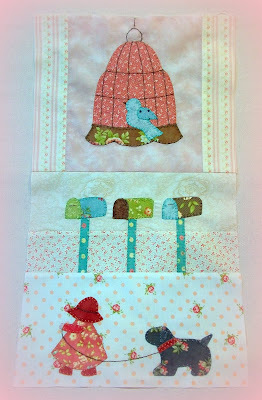 This quilt has been so much fun to do......and it is so tweet. The fabrics just make the quilt and Bunny Hill's attention to detail in the pattern is incredible. This is block three and completes the top row of the quilt. I'm already starting on four as we speak, I can't seem to put it down. This is a BOM offer at Kindred Spirits Quilt Co. store starting this fall....Mary needs to make this for her new grandbaby that's on the way!